Course Numbers: Spaces are limited to 8 participants with an instructor to student ratio of 1:4. Inclusion in the Course is dependent upon prior experience and at Instructor’s discretion. Registration closing date: 10th October, with all payments to be made by this date. 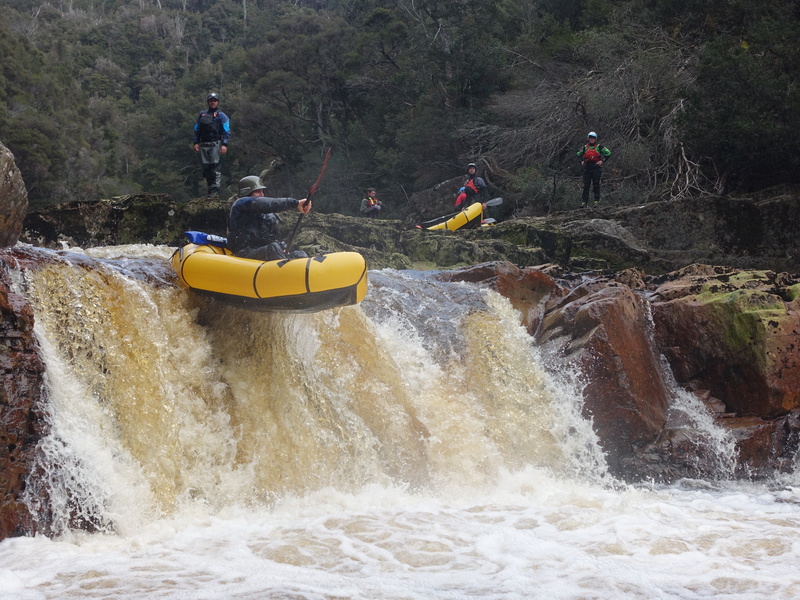 Paddle Tasmania, formerly Canoe Tasmania, will be conducting an Advanced Whitewater Packrafting Course in north-west Tasmania as a 3-day multi-river program. The group will stay at the Arm River Outdoor Education Centre for both Friday and Saturday nights. This hardtop camp is 5-minutes drive from the Mersey White Water Regional Reserve which we intend to use as our initial teaching venue. Both practical and theory sessions will be conducted. The course will conclude on the Sunday afternoon at about 4:30 pm near Launceston, or if utilising more remote rivers still in the NW then it will conclude around 3pm (with then a 1.5 hr drive to Launceston). The focus of this course is on developing technical and safety knowledge specific to packrafts being used on grade 3/3+ whitewater. There will also be considerable emphasis on working as a team to manage challenging river environments safely. Depending on water levels the group MAY tackle grade 4 rapids however there will always be the option to walk/portage these. Note the paddling venues utilised for the course are highly dependent on both water flows and the group’s experience and ability. Ideally we aim to paddle the Mersey Whitewater Course on the Friday and the Lea on Saturday before heading back through Launceston early on Sunday to paddle the North Esk (less than 20 minutes out of Launceston). There are numerous other suitable rivers though that we may paddle instead of those listed. To learn more about the various sections of rivers that the group may potentially utilise see the following links. Starting Time & Venue: Friday 26th October – Meet at 9.00 am for a 9:30 am official start. The starting venue is the Arm River Outdoor Education Centre where we will begin with a theory session. The camp is located approximately 850m up Maggs Road (take the first turn right after crossing the Arm River on the Mersey Forest Road). It is approximately 1 hour from Deloraine. The Arm River OE Centre has basic communal bunk rooms, basic kitchen facilities and toilets/showers. Note that there is almost no phone coverage after you leave Mole Creek and definitely none at either the paddling or accommodation venues. All participants are expected to stay at the camp for both Friday and Saturday nights. Interstate Flight Bookings: It is recommended that interstate participants fly into Launceston on the day/evening prior to the course. Regarding departure it is recommended that flights are not booked until after 6pm on the Sunday. Flying into Hobart adds an extra 2.5 hours to travel times. Travel: We encourage participants to car pool if possible to both minimize environmental impact but also to reduce the number of cars required to be car shuffled at various times. Please let the Course Coordinator know if you are NOT happy for your email and your starting location to be distributed to other participants. Likewise let us know if you are looking for transport. Paddling Gear: Participants will need to provide and bring a suitable packraft & all personal paddling gear including a decent whitewater PFD, paddle and whitewater paddling helmet. To get the most out of the course it is expected that all participants will have packrafts with thigh straps. A whitewater decked boat or self-bailer is recommended whilst whitewater kayak helmets are compulsory. If you are unsure of your boat or helmet’s suitability please contact the Course Coordinator. All participants should come fully prepared for numerous swimming activities and will require a full-length wetsuit and a drytop OR a full drysuit. There is also the possibility that the group may walk into or out of some river venues so decent footwear is required along with a lightweight pack in case you need to carry all of your gear for a river daytrip. Sleeping Gear & Food: Single mattresses on bunks are provided but you will need to bring a sleeping bag and pillow (if you like). Accommodation is communal bunkhouse style. The camp kitchen is basic and has a very limited number of pots and pans and one stove top/oven plus microwave, toaster, etc. You will need to bring your own personal eating utensils and crockery. Participants need to bring all food for the duration of the course as there are no shops or services at all nearby. Registration is a first in first on the course, but you will be added to the waiting list.